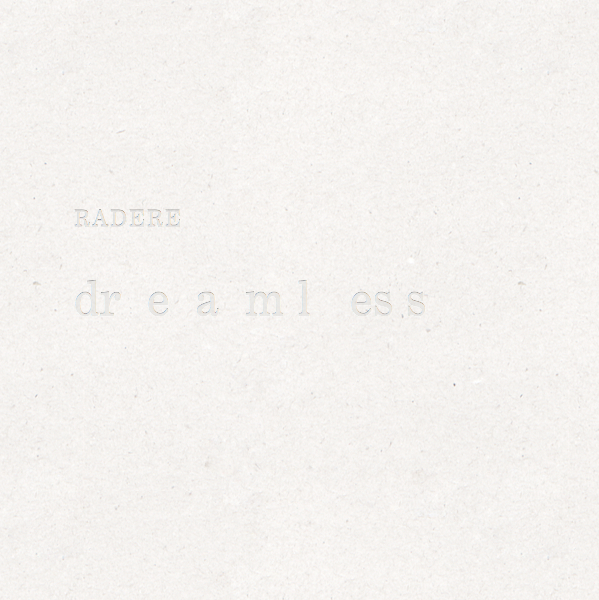 Radere, the monicker of Carl Ritger releases his latest album, Dreamless, on Full Spectrum Records. This partnership is a great fit for both parties. By my reckoning, this is the third release by Radere on this label. Dreamless – untroubled by dreams; “a sound and dreamless sleep”. Seems like Carl has been having an easy time of it lately with his ‘sound and dreamless sleeps’ and, if that is the case, then long may it continue. This release is just amazing, I thought he had mellowed his music especially when you hear the first track ‘Beginnings’ its a track that has looping guitar sounds and is all very intricate and beautifully executed, then ‘Widowmaker’ comes calling and that is the complete opposite of the first track. If the first track is the ‘Beauty’ then this is the ‘Beast’. Oscillating sounds, panning from left to right and back again, maximum feedback and electronic sounds being composed then decomposed a plenty. ‘I Remember You’ is a lighter drone, with a more expansive sound than the first two tracks, there may even be a hidden melody in there somewhere, but you will have to use your imagination and submerse yourself in the music. The 4th track ‘Summer Sun’ is the longest track on the album and a very enjoyable 9:34mins it is too, it gently twists and turns its drone sound and then fades away to make way for the last track ‘Marin’ which is a fine track and is a fitting end to another fine release by Radere. Radere sets the bar high with his compositions and creativity and this release places him at the top of his game. Hopefully the Radere/Full Spectrum partnership continues for quite a few more releases. This entry was posted on February 27, 2013, 8:31 pm and is filed under Playlists. You can follow any responses to this entry through RSS 2.0. You can leave a response, or trackback from your own site.